Editorials from Theslowlane: How about lowering corporate tax rate by raising taxes on wealthy people? How about lowering corporate tax rate by raising taxes on wealthy people? 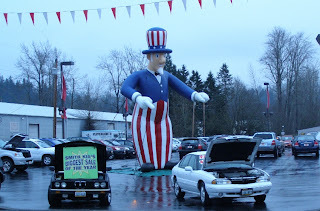 Uncle Sam balloon promo at car sales lot. Some folks, especially on the left, lump corporations and the wealthy together. Corporations and wealthy individuals are different entities when it comes to how the economy works. Taxes paid by corporations tend to be just passed through the corporation and come out as higher prices for the corporation's products and services. They can also come out as disincentives for the corporation to invest in assets and employees within the taxing jurisdiction. The corporation isn't really a person, contrary to popular belief. It's just a go between. Corporations are a go between among various people in society such as consumers, shareholders and employees. Some economists call for lowering corporate taxes in USA because this country is said to have a high corporate tax rate. A high tax rate creates disincentives for corporations to do their business in America leading to outsourcing of a lot of corporate assets and jobs. Of course corporations do get out of a lot of taxes by taking advantage of loopholes, but there are quite a few economists who believe that lowering corporate taxes would help the American economy. It would help by allowing vast amounts of the money that US corporations hold overseas to be brought back home. Some of this money would be paid in taxes during a windfall period as the money comes back home providing a temporary boost to the treasury. More importantly however, a lower corporate tax rate could create a greater incentive for companies to do business in America. More domestic jobs as business activity comes home. Seems like most of the proposals to lower corporate tax rates are just more tax cuts so I say, how about accomplishing this goal in a more revenue neutral way? Lower corporate taxes while increasing taxes on wealthy individuals. Unlike the official corporate tax rate (aside from the loopholes) wealthy individuals are getting away with real low taxes in USA compared to other industrialized countries. Taxing wealthy individuals more and business less would create an incentive for the money to be invested in businesses, rather than just being hoarded. It could encourage wealthy people to invest their money in American business so that money could work in the economy. The money could go to creating jobs and business facilities in the US rather than just lining the pockets and overseas bank accounts of wealthy individuals. Let's have the economy spend more money on producing goods and services for the public rather than just buying things like luxury yachts and summer homes for the wealthy. Problem is, so many of the wealthy and their pundits want it all. The seem to want nothing but tax cuts rather than accepting some tradeoffs.